The fifth installment in Jeff Jackson’s monthly column for Fanzine, Ideal Home Noise, in which he rounds up some of the more compelling recent releases you should think about letting loose in your world. – ed. The Hairy Who’s time is now. 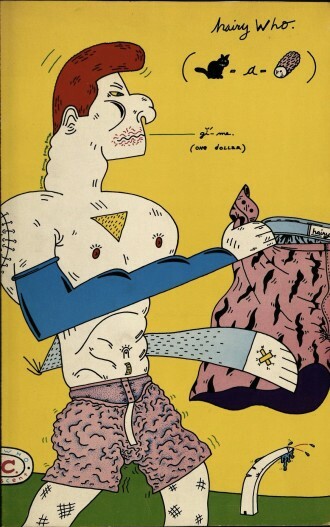 This Chicago art collective from the 1960s – comprised of Jim Falconer, Art Green, Gladys Nilsson, Jim Nutt, Suellen Rocca, and Karl Wirsum – created dazzling paintings and sculptures that combined cartoon imagery, architectural surrealism, advertising tropes, Mesoamerican designs, and comic book narratives. Their work was out of step with the minimalist and conceptual art world trends of the time, and maybe that’s why it feels so fresh and contemporary today. The group’s eye-popping colors, twisted pop art tendencies, and rigorous formalist designs remain vibrant, deeply strange, and immediately appealing. In 2003, critic and curator Dan Nadel wrote in the third issue of The Ganzfeld that The Hairy Who’s output was “some of the most important (and neglected) work in post World War II America.” Thanks to his efforts, it’s no longer quite so neglected. The Hairy Who was prominently featured in his acclaimed traveling exhibit and book What Nerve! Alternative Figures in American Art, 1960 to the Present. 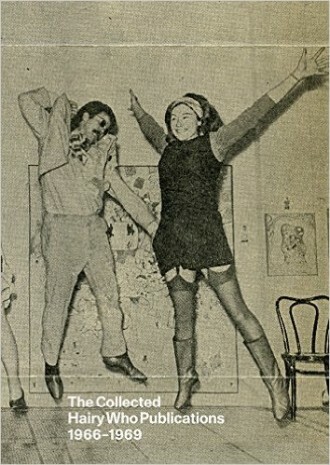 And now he’s put together the most essential volume yet on the group, The Collected Hairy Who Publications, which reproduces the catalogs for the group’s five exhibitions. The Hairy Who couldn’t afford to print traditional catalogs, so instead they created comic books for each of their shows. Where older pop artists appropriated comic book imagery, The Hairy Who went a step further. Inspired by comic book storytelling, they introduced fractured bits of narrative, multiple panels, and text into their work. Their publications created a new zone of expression somewhere between underground comi x, consumer catalogs, and fine art. While each of the artists in the collective had their own distinct style, their sensibilities were closely aligned. This is most apparent in several exquisite corpse drawings they created together for their publications, which look remarkably cohesive. This book beautifully reproduces the bold and unusual colors of the catalogs, adding fascinating photos of the exhibitions themselves, including site-specific wallpaper, cabinets, and seating created by the group. For anyone interested in the artier side of comic books and pop-ier side of visual art, The Hairy Who’s work echoes with exciting possibilities that remain unexplored. The Well-Dressed Wound embodies so many things at once that it’s hard to believe the novel occupies a mere 70 pages. It’s a historical novel set during the Civil War; a séance conducted by Abraham Lincoln and his wife to reach their dead son Willie; and a play of this scenario presented by P.T. Barnum. As the play’s action unfolds, fashion designer Martin Margiela appears and transforms the proceedings into a demonic fashion show. This show unveils his latest line: AIDS. And to top it off, the ghostly role of Willie, a gay fashionista, is performed by the author. If that sounds dizzying, it is. But it’s also not hard to follow. McCormack writes with precision and clarity, expertly framing every shift in perspective. His minimalist prose is also extremely stylish, deploying exclamation points like designer accessories and inventively using the white space of the page. Ultimately though, it’s the tone of The Well-Dressed Wound that’s most impressive. The novel conjures so many conflicting feelings at once that it vaults into some previously undiscovered emotional register. It’s simultaneously a work of desperate obscenity and camp insouciance, a cleansing scream of anguish and a gleefully funny romp, a story about death and an homage to fashion. In McCormack’s fun-house mirror universe, history is a hobbled pageant and the runway a teeming necropolis. 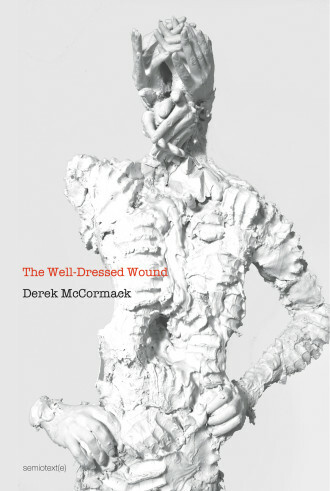 The Well-Dressed Wound is novel of the plague decked out in a designer ensemble that happens to resemble pus-oozing bandages, which only proves that it’s pure couture. years of his life, including an epic six-year shoot. He died shortly before the film was finished, but his vision was seen to completion by his wife and son. He achieved that with this film which takes place on a planet similar to Earth that’s stuck in the perpetual gore and grime of the Middle Ages. German made few movies, though films like My Friend Ivan Lapshin (1984) and Khrustalyov, My Car! (1998) are regarded as masterpieces by those fortunate enough to have seen them. We’re lucky that Kino has made his final film widely available in a gorgeous Blu-ray transfer. It’s not hyperbole to call Hard to Be a God the most extreme vision committed to celluloid. 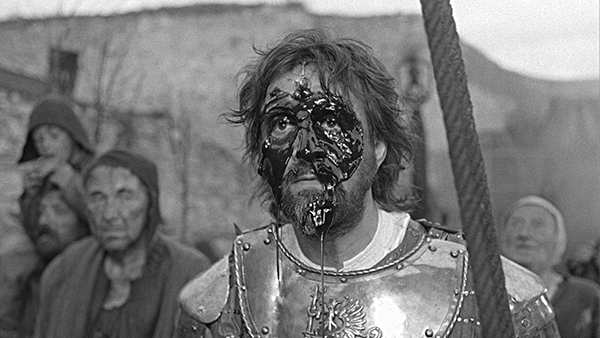 The New York Times claimed it “makes Werner Herzog’s Aguirre, The Wrath of God look like Downtown Abbey.” That’s fairly accurate, though it doesn’t necessarily mean it’s better. The movie is an adaptation of a novel by Boris and Arkady Strugatsky, best known for Roadside Picnic which Andrei Tarkovsky adapted into Stalker. The narrative revolves around a scientist who’s landed on a medieval planet but has sworn not to interfere with its progress. Though treated like a god by the natives, he’s increasingly affected by the brutality around him. I need to emphasize that if you watch this movie for its story, you’ll quickly go insane with frustration. The narrative is submerged in the muck and mire of the ravishing visuals. 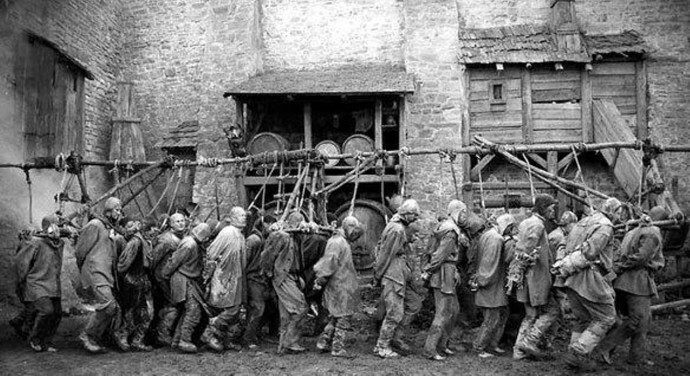 Filmed in glorious black-and-white, German’s world is rain-drenched and piss-soaked, a blood-tide of cascading intestines, a teeming pageant of squalor and wonder. Unlike many art films, it’s not filled with long stationary takes – instead the camera is constantly in motion and the frame packed with startling imagery. At three hours, the movie demands you patiently immerse yourself and navigate it according to its own rules. 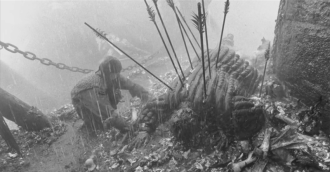 I’m honestly not sure how to evaluate Hard to be a God without many more viewings, but I do know that it’s a must-see if you have any interest in exploring the extreme reaches of cinematic art. Even if you can’t stand it, good luck trying to scour it from your brain.